Description: The Math Starter is a red and white electronic learning aid with numeric keys and math symbol keys, such as +, -, x, =, etc. The keypad is horizontal, and the LCD screen is vertical with a built-in handle at the top of the case. The left side of the screen has a yellow "1" with a boy running beside it, and the right side has an orange "9" with a girl running beside it. This math starter teaches skills such as counting, addition, subtraction, multiplication, division, and a chase game. Requires 2 AA batteries. Designed for children ages 3 years and older. 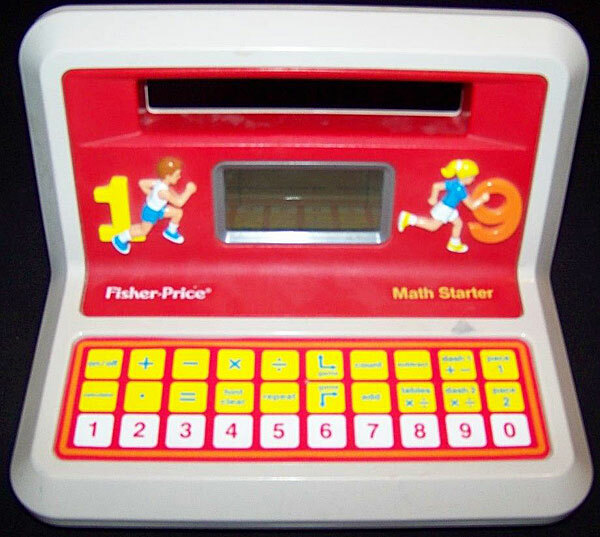 FPT44994 - Math Starter, described above. FPT44995 - Math Starter Instruction book. Sold in a 12" long, 12" high, 5-1/2" deep display box with a lid. Also see #6600 Spelling Starter, as it is the same size and shape as the Math Starter, but colored blue and white opposed to red and white.